HI I do not often commenton anything and really have not researched amish christians but I do suggest you read Isaiah as it beautifully demonstrates God’s merciful and endless love to the jews and to us also.. No one can stop God from loving him. Many christians have perverted Gods wonderful love.I believe you are on your way to freedom where you will find a loving father. I can’t believe that an Amish would become an atheist. Write something in the Amish language, such as the answer to this question, for instance. Bish du uff der alt bavverei uffgvoksa, udder woss? Viffel kinna hushde dahaym kodda? Unn vee sinn die kee dott tzurick uff der alt bauerei? I think this shows clearly that God is infinitely good and merciful. This comment was of course a reply to Kitty. For the record, I have not watched Breaking Amish. I did watch all of Amish Mafia. As with anything on television, including ‘news’, there is no such thing as 100% truth. Yes folks, it is actually legal for the ‘news’ to lie in Amerikastan. (federal law, look it up yourself) I live near the A/M actors, and indeed…they are actors. Yes, they may be Amish, Mennonite, or ex-whatever…but if they are paid to be on film, that makes them ‘actors’. (nobody ever said ‘good actors’) I have actually worked with some Amish. It seems that every other male Amish is a ‘preacher’, but that may have been just my own circumstances; don’t know, don’t care. I made their oldest ‘preacher’ angry by telling him exactly what I believe, as well as why. Wow, do they get mad when they’re basically proven wrong…that’s easy to do with anyone with such a limited education and/or exposure to the real World. I will watch A/M’s new season, and mainly to see what other lies they present as ‘reality’. Umm, No. Atheism is the belief (or understanding?) 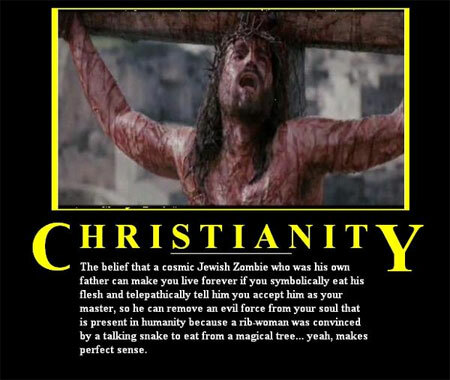 that no superhuman being(s) (God) exists and had/has no part in the establishment of the universe and life as we know it today. 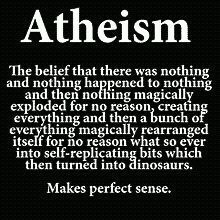 It doesn’t promise the real explanation behind anything unlike this something called “science” that most of the times does a pretty decent job.We may or may not unravel the secrets of the universe but we atheists find the ways and explanations offered by religion illogical and fictional(sometimes damn hilarious too! ).